Are you a real foodie? True foodies or, more precisely, adventurous food lovers (love it or loathe it, the term “foodie” satisfies our penchant for brevity) have a burning desire to experience the local cuisine wherever their wanderlust happens to take them. Like famous U.S. tele personalities Anthony Bourdain and Andrew Zimmern, one characteristic you must possess is a willingness to step out of your comfort zone and try just about anything that the local culture considers food. Since much of my travel involves business trips with to China, I’ve become quite the student of local cuisine and street food in the major megalopolis of Hong Kong, Shanghai and, most recently, Beijing. 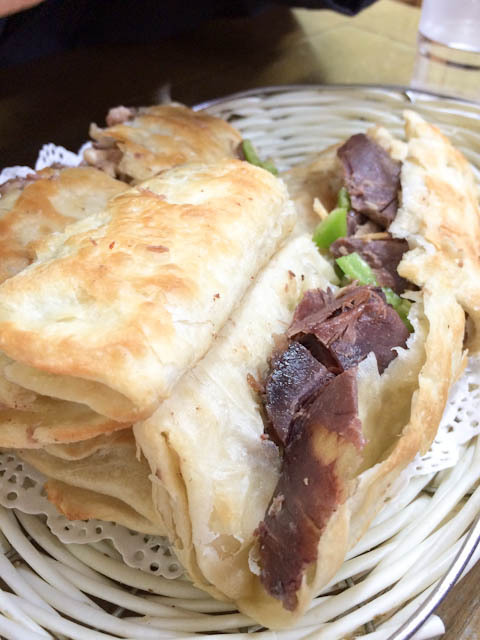 I’m not knocking fine dining, because I do it, but many travelers are on a budget and there’s not many places where you can satisfy your hunger with a humongous sandwich of tender donkey meat for less than 10 renminbi (RMB) – that’s $1.57 USD at today’s exchange rate! And yes, I said donkey meat, and it was tasty. First, you have to go to one of the many hutong areas in Beijing – all the photos and food here can be found in Huguosi hutong in Xicheng District which has an entire street lined with “snack” shops. 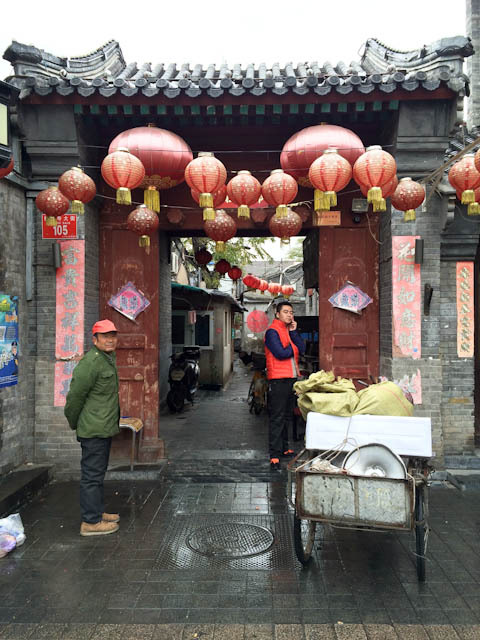 Hutongs are a maze of narrow, sometimes cobblestone, streets with tiny shops and street-side vendors and dim alleyways leading to courtyards where Chinese families have lived for centuries. 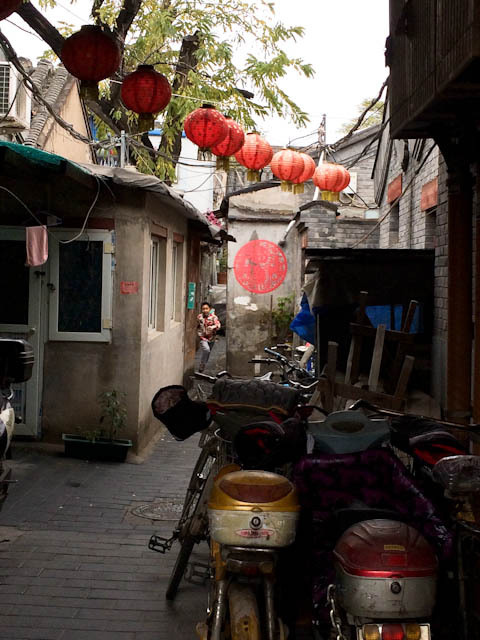 The hutongs that have survived the urbanization of Beijing offer a glimpse of life in the capital city as it has been for generations. Many of Beijing’s ancient hutongs still stand, and a number of them have been designated protected areas. You may have heard about stinky tofu and it tastes better than it’s unappealing name implies. 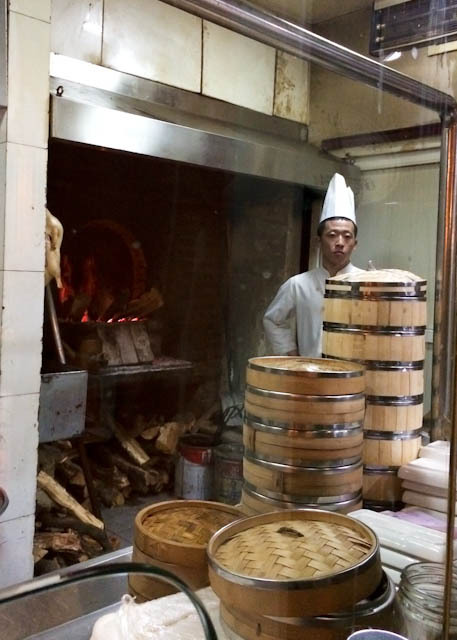 Many cities have variations on chou doufu and its origin is a well-worn story, but according to Zhao Chunyang, a well known local Beijinger who keeps the legacy alive, the stinky aroma is connected to geography – e.g. 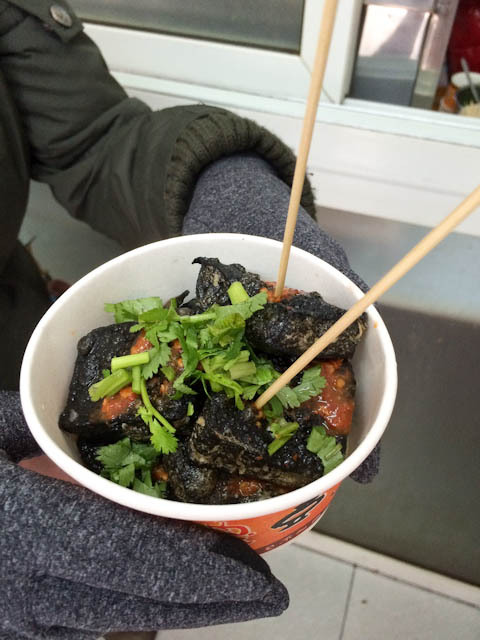 Changsha’s famously funky tofu is black, which happens to be the stinky tofu that I tried on the Eat + Drink + See tour that I took with Hias Gourmet. Zhao also says that the aroma wafting through the streets is not the tofu itself, but rather the oil cooking it that releases its fragrance. The coloration is attributed to long fermentation and local airborne bacteria that helps create its characteristic bouquet. Zhao notes that in Beijing, people tend to eat golden-skinned chou dough, which is fermented for a shorter time and therefore less pungent. (Source: CityWeekend.com/cn). Stinky tofu is considered a snack – as most of the foods on this tour are – and the three of us shared a bowl – skewers are provided. Swathed in chile garlic sauce with a sprinkle of bright chopped cilantro, we all enjoyed the warm chewy fragrant squares of blackened tofu, I only wished there was a cool beer to complement the crispy, spicy, garlicky bites. Donkey meat is a popular snack food or lunch in some areas of China, but I also read that it’s considered a delicacy – in Beijing it’s often eaten for lunch or as a snack. 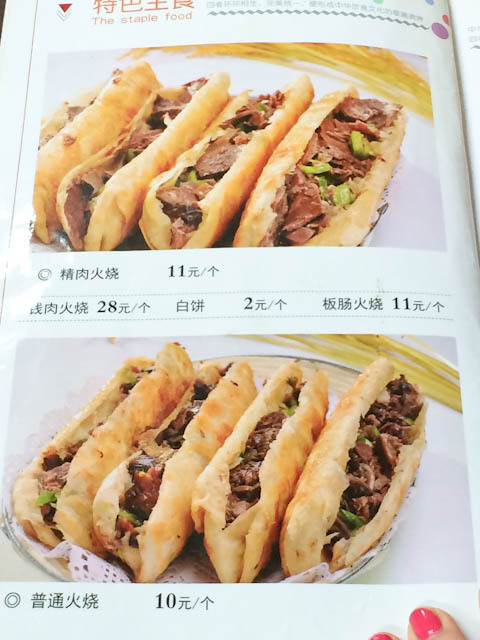 We ducked into Wangpangzi which our guide says is one of the better donkey places in Beijing, and ordered one lean and one fattier version of what translates as a “burger” because it’s on a “bun” – there’s really no translation for hoagie or sandwich. The meat was tender and tasted very much like beef and the fact that it was wrapped in what is best described as a flaky flatbread with a little greenery made it quite palatable. Again, screams for beer! I first tried jianbing in Shanghai and it’s been my favorite Chinese food since! A typical hearty breakfast for workers, it’s a delicious combination of flavors and textures and, since it’s widely available street-side, it’s also a popular snack for late night bar flies. 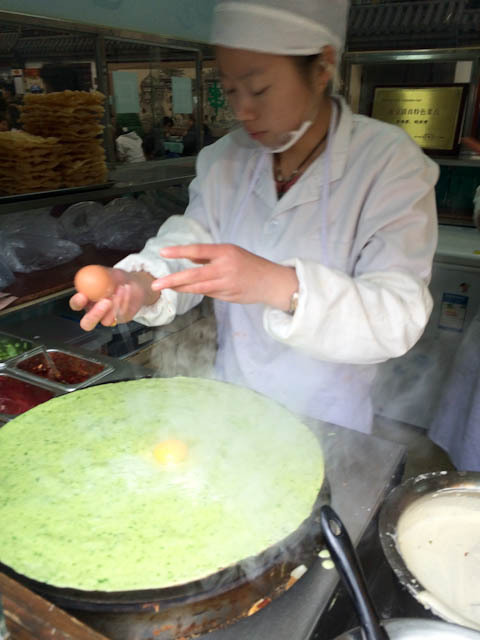 A standard jianbing is a very think crepe made from a batter of wheat flour (or millet) and topped with an egg, chili sauce, hoisin sauce, spring onions and baocui (crispy fried won-ton skins) and cilantro. It’s delicious blend of crunchy, soft, and chewy textures all rolled up into one Chinese egg burrito-like moveable feast. 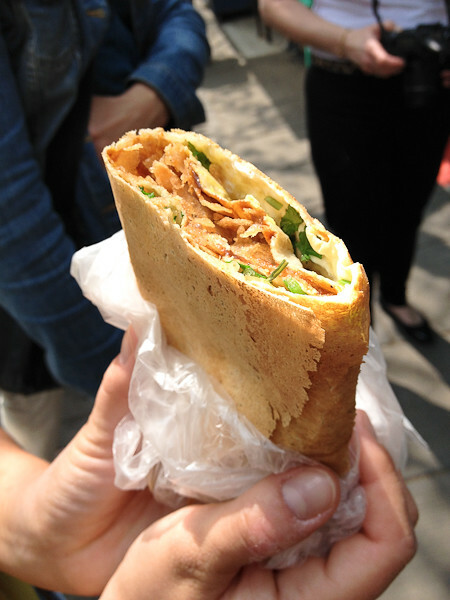 In Beijing you’ll often hear the word “jing” as in the jianbing above – usually translated as “pancake”, but not the traditional kind of pancake we’re accustomed to, so our guide Shannon referred to it as “flatbread”. You probably already know about bao or steamed buns if you live in any ethnically diverse area. In NYC the ubiquitous street food has been glorified by Momofuku and transformed into a trendy, gourmand must-have! In the country of origin, they are a favorite breakfast food in the north and a favorite grab-n-go comfort food snack. 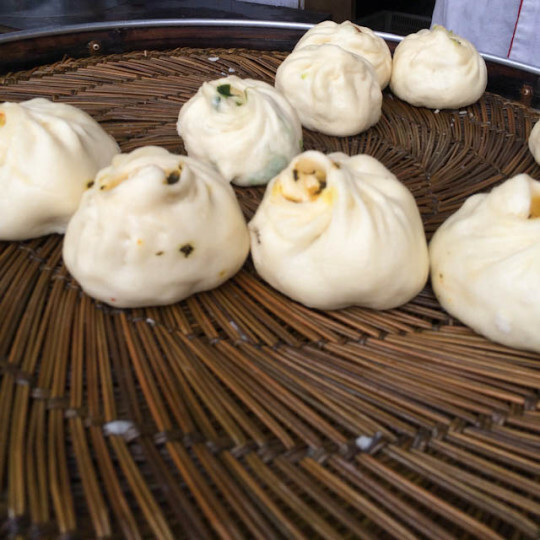 The white doughy buns enclose a delicious array of fillings including pork and cabbage, beef and green onion. Other parts of Asia favor BBQ pork. They can always be found near transportation hubs to catch commuters on their way to work. And of course, no trip to China is complete without Noodles! Generally, we think of rice as the staple of Chinese people, but that’s more of a southern reality. In the north, staples are wheat-based which means noodles and breads. Shannon pointed out that this is a result of the northern climate – wheat grows much better in the colder, dryer conditions of the north, while rice requires the wet and humidity of the south. The noodles we ordered were hearty and slightly chewy and available with a variety of ingredients – really, it’s all about the sauce which is a fried combination of fermented beans and pork. 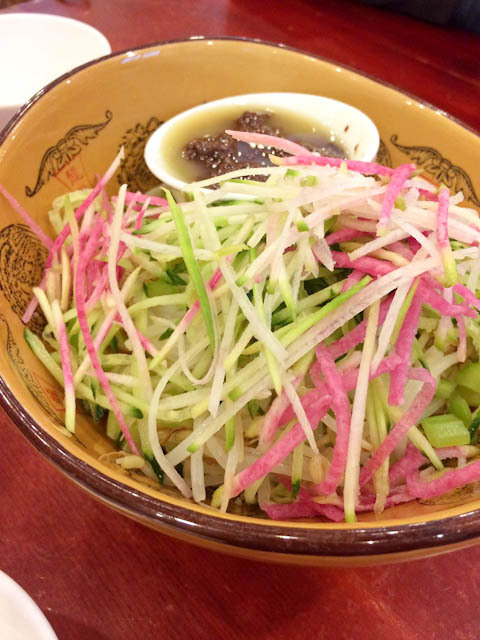 The noodles are most commonly served with condiments of cucumber, mung bean sprouts and soybeans which lend color and the satisfying crunchiness of fresh veggies. Finally, while in the capital city you must have the famous dish named for the city that made it famous: Peking Duck, or Beijing Duck – the city did not change it’s name, but rather the Mandarin name (Peking) became Beijing when the Pinyin method (the Romanization of the Chinese characters based on their pronunciation) of conveying Mandarin in the Roman alphabet was adopted as an international standard. After reading reviews on Trip Advisor of several of the top rated roast duck restaurants in Beijing, I chose Guoguo Sifang Roast Duck. It was far less expensive than the touristy spots which rated higher, but even if you’re not on a budget, you won’t be disappointed with Guoguo Sifang (translates to “Private Kitchen”). Our Chinese colleagues check ratings on a Chinese restaurant review site and it was popular with locals and expats (as we discovered when we went). The duck was lean with perfect crispy skin and prepared to order in the large wood-burning “oven” of the open kitchen. The beer is cold and the sides, especially crispy shrimp, Beijing-style noodles, and garlic eggplant, were reasonably priced and tasty as well. 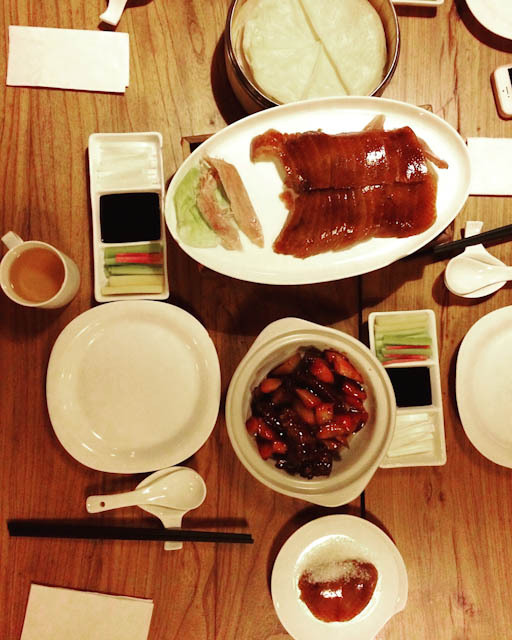 We ordered two whole ducks and a bunch of sides and our bill was less than 800 RMB for 8 people! No one drank – except for me ;) – so that’s another reason, but the beer is cold and they also have wine. The atmosphere is quite nice, with stylish wooden tables, bird cage hanging lights and large painted origami-like birds on the ceiling.